You simply can't go wrong with Moet and chocolates, to celebrate a special ocassion, or to express your appreciation of a special person. 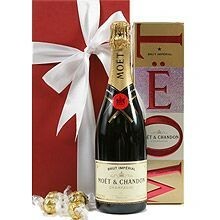 Elegant and sophisticated, this boxed bottle of Moet & Chandon NV French Champagne comes gift wrapped with quality Lindt Chocolate. If you are celebrating with champagne, this gift will show you chose the best! This product may only be purchased by persons over 18 years.